A garden isn’t just for summer! It’s so tempting to clean your garden tools down at this time of year and squirrel them away until spring but if you have sturdy planters to hand, don’t miss these simple seasonal planting tricks to really lift the hearts of your house (and garden) guests. We love the portable flexibility of planters in the garden. The smallest of spaces – patios, balconies, tiny courtyards, steps, doorway alcoves – can all be transformed through the seasons with annuals, perennials and dwarf shrubs, even into the depths of winter with some of our favourite hero hardy plants. Clever lighting can also draw the eye into gardens, bringing shrubs and structures to life in the winter gloom. Drape twinkling fairy lights over shapely bushes and topiary in planters or, for herbaceous perennial planters where plants die down in the winter, consider illuminated obelisks as well as carefully placed, architectural sprayed sticks and branches. Have a look at our Winter Planters Pinterest board to get a better idea of the possibilities and read on for more planter planting planning ideas. Think impressively shaped evergreens, berries, pretty under planting and even unexpected and bewitching scent punctuating pathways and at entrances. For dependable flowering and berries we recommend good old Skimmia japonica and, with its small white flowers glowing through the gloom, Osmanthus x burkwoodii. Buxus sempervirens (Box), Laurus nobilis (Bay) and varieties of Ilex (Holly) are all good candidates for shaping into balls, pyramids, columns, half and quarter-standards. For all container shrubs, planters can be pepped up with seasonal under planting. 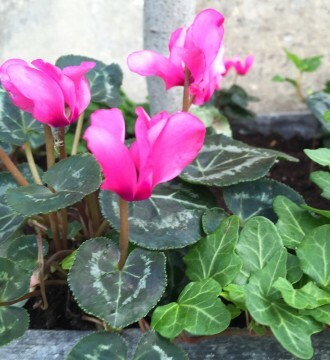 Pretty Cyclamen coum is ideal for this, with trailing Hedera (Ivy) to add texture and interest. There are plenty more winter pot planting ideas online but these classics are a wonderful start. While you’re here, it’s also really worth thinking beyond the fairy lights into spring when more natural jewels can start to sparkle in your planters. Invest in some bulbs to sink into any spare containers or in spaces amongst potted shrubs. Come March, the peeping shoots will promise the first flower displays of the year. At Garden Requisites we ask a lot of our metal planters and they really do stand out from the crowd as a result. They need to be sturdy, frost-proof and very long-lasting so we forge them in zinc-galvanised steel. They also need to say ‘handcrafted’. Enhanced with a cleverly applied weathered-look patina that will age gracefully, the circular or square containers aren’t just reminiscent of beautiful old lead planters but they are lighter and more robust. We’ve also thought carefully about drainage so each metal planter has several drainage holes around the perimeter and four solid steel feet for added stability and air circulation. Considering the usual turnover of rotting wood, cracking terra cotta or bowing, mass-produced metal containers in the garden, the longevity of our steel workhorses is so worth the investment. Do ask if you’re interested in bespoke sizes and shapes such as troughs or taller pieces. Because we make to order, sizing for your unique space can be spot on. Now then, do you mind if we pop out to the local Garden Centre for a bit? Need more Cyclamen!